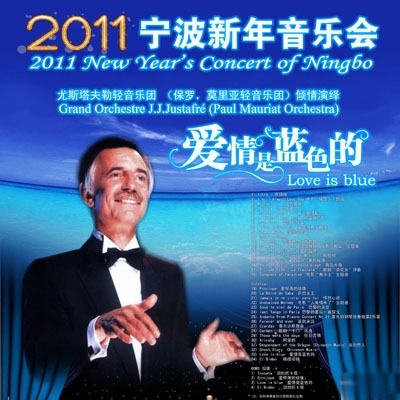 On Jan.4, 2011 French famous musican J.J. Justafre and his orchestra, the former Paul Mauriat Orchestra is going to hold the New Year’s concert «Love is Blue» in Ningbo Grand Theatre. Since the French musican Paul Mauriat has passed away in 2006. the orchestra almost went out of people’s sight. However, J.J. Justafre who was appointed as music manager by Mr. Mauriat leads the orchestra come back now. Mr. Justafre has participated in the performance and rehearsal of Paul Mauriat Orchestra for many years. Many pieces of musical work came from the cooperation of Mr. Justafre and Mr. Mauriat. Mr. Justafre inherits the style of Mr. Mauriat’s music. Meanwhile, he brings into the orchestra his own character. Under the agreement of Ms. Mauriat, he replaces his name to Paul Mauriat orchestra. The concert Love is Blue is in memory of Paul Mauriat.